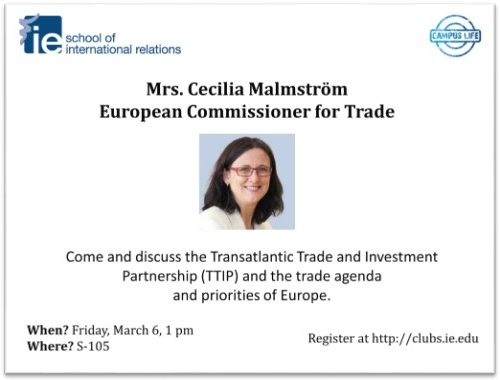 IE School of International Relations is pleased to invite you to a discussion with Ms. Cecilia Malmström on the much debated Transatlantic Trade and Investment Partnership (TTIP), and the trade agenda and priorities of Europe. The event will take place on Friday, March 6th at 1.00 pm (Room S-105, Calle Serrano 105, Madrid, Spain). Since assuming office in November 2014 as the new Commissioner for Trade under the Juncker Commission, Ms. Malmström and her team have been at the forefront of the negotiations of the TTIP with the objective of reaching a balanced and reasonable agreement with the U.S. that respects Europe’s safety, health, social and data protection standards, and Europe’s cultural diversity. When negotiations are completed, this EU-US agreement would be the biggest bilateral trade deal ever negotiated. Prior to becoming European Commissioner for Trade, Ms. Malmström served as European Commissioner for Home Affairs (2010-2014) and as Minister for EU Affairs in the Swedish Government (2006-2010). She was Vice-President of Folkpartiet (Swedish Liberal Party) from 2007 to 2010, Member of Folkpartiet Party Executive (2001-2010), and Member of the European Parliament (1999-2006).